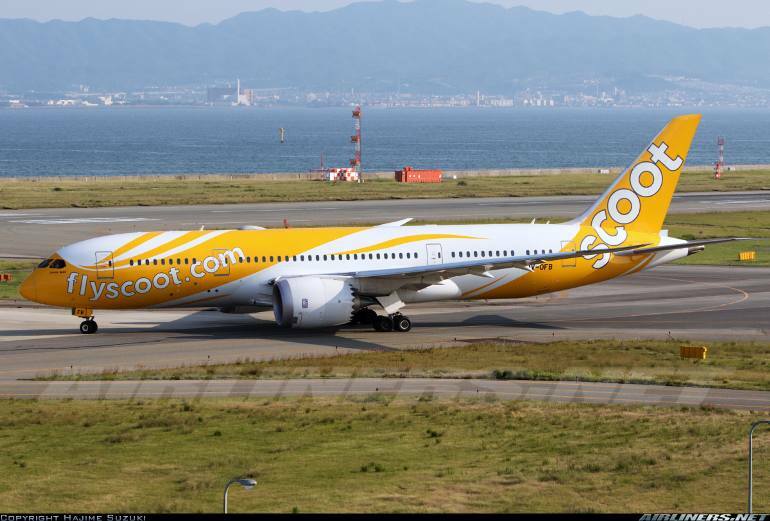 Welcome to my Flying Adventure on Scoot's Boeing 787-8 Dreamliner! This Scoot's soon-to-be retired Boeing 777-200ER (C32 Y320) was still flying at that time, now its retired. The difference between the -8 and -9 series of the 787. Can you see the difference? 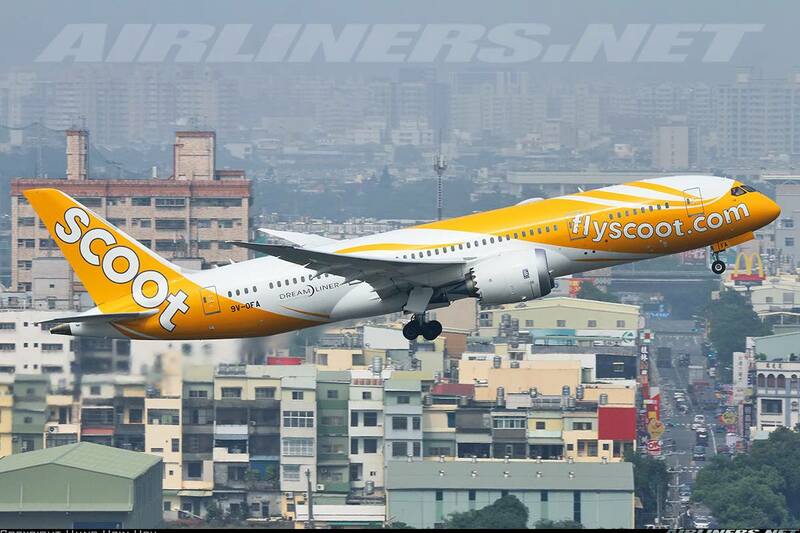 Scoot is a Singapore based airline, a subsidiary of Singapore Airlines, launched flights in 2012. Initially, this airline operated a fleet of Boeing 777-200ER obtained from its parent airline to operate on short to medium high demand routes. In 2015, the airline took delivery of its first Boeing 787 Dreamliner (-9 first) and later on the -8 series joined the fleet. The early batch of 787s are 1 to 1 replacement for the Boeing 777s and currently (November 2015), only 1 Boeing 777-200ER is left (9V-OTC) and is used for back up. 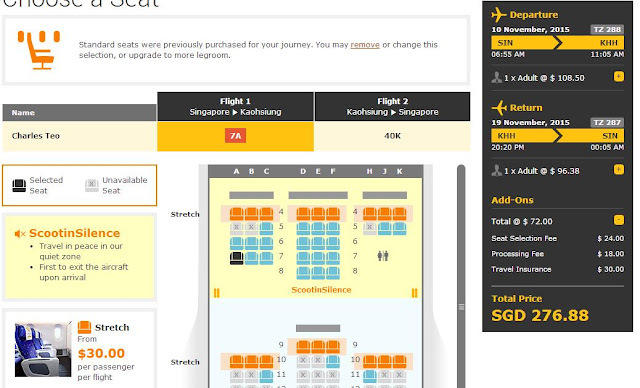 Officially launched in 2011, Singapore Airlines announced that it would establish a no-frill low cost airline to operate on medium to long haul routes to compete with Air Asia X and offer cheaper air fares for budget conscious travellers. 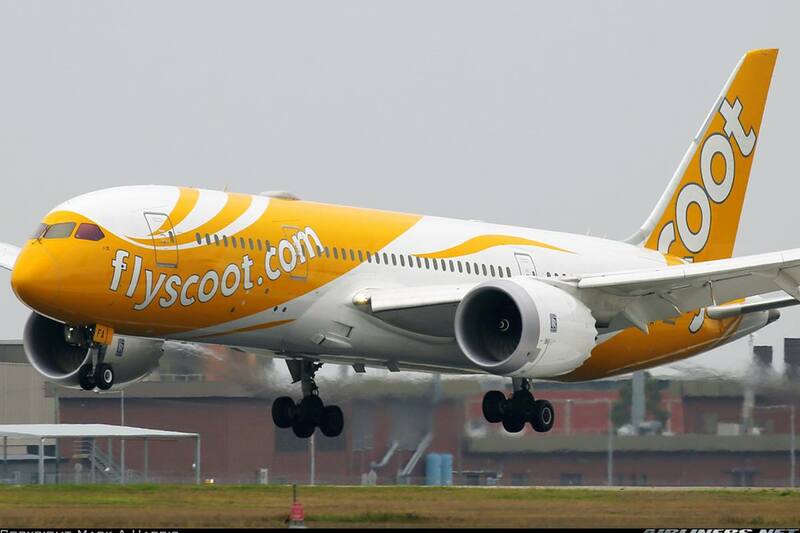 1st November 2011 was the official launch date of this airline and the name 'Scoot' was decided then. The initial IATA code for this airline was OQ but later on, it was changed to TZ. 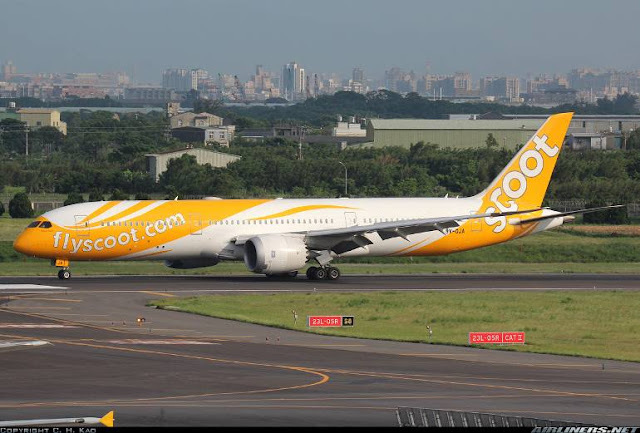 In 2012, Singapore Airlines announced that it would be transferring its order for 20 Boeing 787-9s to Scoot and instead operate the bigger version of the 787 family, the -10. This airline later announced it would consider adjusting its order to operate a mix fleet of -8 and -9 series of the 787 aircraft instead. In 2013, the airline was operating 5 Boeing 777-200ER and added the 6th aircraft later on, and these aircraft come from Singapore Airlines. The airline also announced a change in its Boeing 787 order and that is to split the order of 20 Boeing 787-9 aircraft to 10 Boeing 787-8 and 10 Boeing 787-9 aircraft. 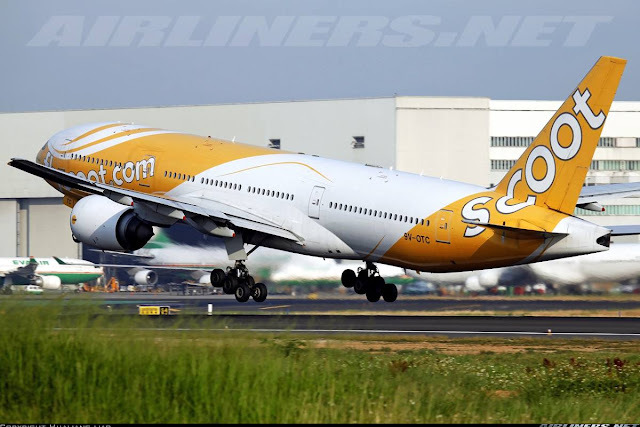 By the end of the 2014, the airline announced its venture with Nok Air and started medium-long haul routes from Bangkok Don Mueang Airport in the 2nd half of 2014. This airline would operate Boeing 777-200ER, 3 so far (November 2015) and these aircraft used to fly for Singapore Airlines. The airline took delivery of its first Boeing 787 Dreamliner, a -9 series (9V-OJA) in February 2015 and subsequently more 787 entered the fleet and the airline phrased out the Boeing 777 aircraft one by one. At this time, the airline will take over Singapore Airlines' Singapore to Jeddah via Dubai route and instead fly directly from Singapore to Jeddah from 1st May 2016, subject to regulatory approval. My idea of this trip came around after my Hello Kitty trip adventure, you can check out my trip reports over here. Browsing through some of the airlines' websites, what caught my attention was Scoot's SG50 low airfare and Singapore to Kaohsiung route certainly attracted me. Seeing the airfare was around $285 for the return including seat selection and in-flight meal, I decided to go ahead and do the booking. In addition, the aircraft used for this flight was on the airline's Boeing 787-8. I have already flown on the 787-9 (Trip report over here), so flying on the -8 this time makes sense. Once that was done, it was time to look at other options. Initially, my plan was to stay until 19th November and perhaps book another flight back to Taiwan or somewhere else, but since it was my vacation and I had a bit of spare time, I didn't want to go back too soon and instead focus on deciding what to do next. I decided to return back to Taipei and all I needed to do is find the suitable fare for SIN-TPE sector. However, the air fare for this one way was expensive and after some consideration, I decided to forfeit the return leg (Scoot - KNH-SIN sector) and book TPE-DMK-SIN for around S$230 with TigerAir Taiwan and Thai Lion Air, adding 2 new airlines to my list and extending my stay until 30th November. Since my birthday falls on the 28th November, I decide to spend it in my favourite city. So once that was decided, I did my booking and added 3 domestic return flights: Uni Air's ATR-72 - Taipei Songshan to Magong and Mandarin Airlines ERJ190 - Magong to Taipei Song Shan on the same day, Transasia ATR-72 - Taipei Songshan to Huilien and back a week later and a couple of days later, I booked myself on FAT's MD-80 joyride from Taipei Songshan to Kinmen and back. Sounds crazy? This is what a typical airliners.net trip reporter like to do! This is my itinerary and trip reports will be done. FAT's MD-82 and MD-83 have the same cabin, so won't be doing that. You can refer to my previous trip reports with this airline. Using the airline's website and mobile application is easy to use, but not the most user-friendly websites among all the airlines I flown so far. Do note that you have to double check your booking to make sure everything is correct, any changes requires money which may cost quite a bit. 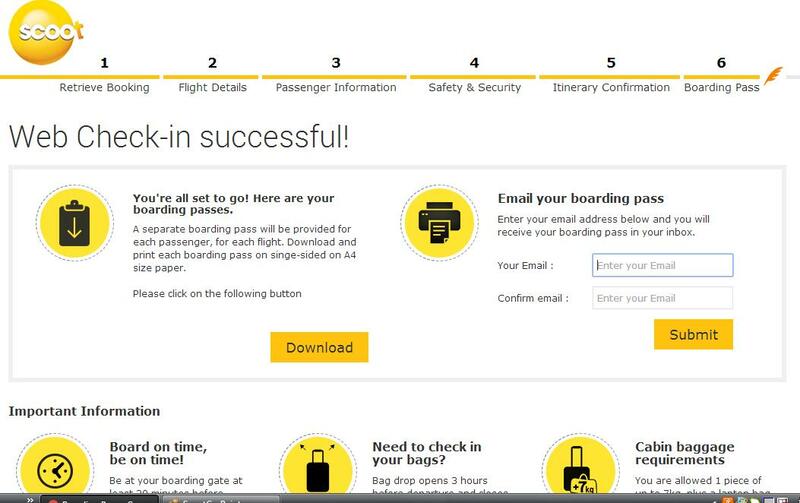 This time, the airline offers web check-in, 3 hours to your flight to 48 hours before departure. If you do the on-line check-in, you can do the early check-in without pay the $5. For early check-in, its 24 hours before departure. 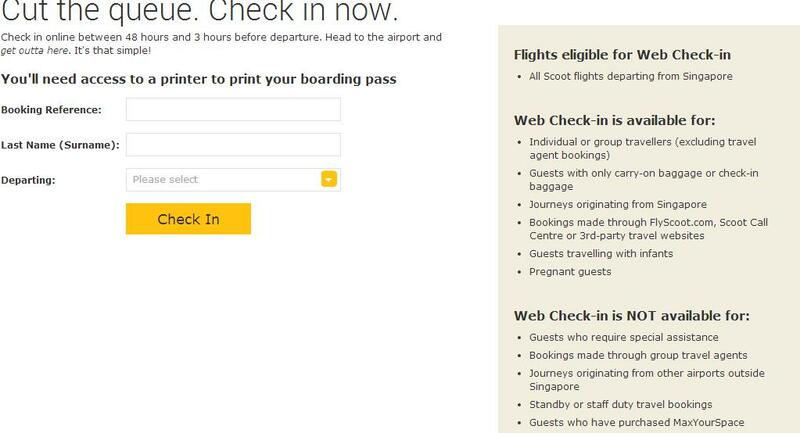 This convenient feature applies only for flights departing out of Singapore. Since the airfare was low, I decided to forfeit the return flight as the one-way fare from Singapore to Taipei during the period I checked was pricey. Love this feature, it makes life easier for us especially there is separate queue for it. Why queue up? Checking the history my flight, 9V-OFB was my best bet to take me to Kaohsiung. Did a quick check on the day itself, 9V-OFA was my ride to KHH. Apparently, this aircraft did a training flight for the pilots to Johor Bahru and back earlier that day. Since the flight was at 6.55 am, I decided to check in the evening of the previous day. My intention was to hang around at the air side and also use the lounge which I paid S$39 for the 4 hours SATS lounge at Terminal 2 to check it out and also spend my time before my flight. A good way to start off my holiday by spoiling myself, right? That means one thing, I had to sacrifice some sleep that night, but in the end, everything turned out well. Scoot check-in counters were not crowded, I got my boarding pass less than 10 minutes of waiting. Remember, Early check-in and Web-check in apply for departure flights in Singapore ONLY. So if you are outside of Singapore, you have to queue up as per normal. Take note of this, travellers! Got my boarding pass, was expecting to be number 1 in sequence and what did I see over here? Number 12! I guess some of them decided to drop their luggages early and proceed on with their sightseeing of Singapore to save money on hotel. I was famished after checking in, so I headed over to Penang Culture (Level 3- Land Side) to have my dinner. This restaurant sells decent Penang food and the prices are reasonable. I also ordered the Jackfruit Drink which is my personal favourite. Once that was done, I went over to Terminal 1 viewing gallery to do some plane spotting. Time passed by quickly, and it was closed to midnight before I made my way to the air side of terminal 2. For Scoot passengers who purchased the $39 for the 'ScootinStyle' option, you proceed to use the lounge at Terminal 2 - SATS lounge only. The time limit is 4 hours and once it starts, the timer goes and you have to leave at the time the staff has told you. One of them would remind you when to leave, and for that they are pretty efficient. Here is how to get to the lounge- sorry for the poor quality. Follow the signs and you will be directed to this location. My 4 hours started and the first thing I did was to snap some photos. It was about half full at that time, so finding a place wasn't difficult. However, there are not too many seats with sockets to charge your electronic devices so if you spot one, grab it. A good variety of food considering its past midnight. Dated looking lounge - nothing much to shout about. Magazines, free Wi-fi, TV screen and food and beverages to enjoy, its a good stop-over to get yourself recharged especially for those on connecting flights. This lounge is definitely not for fussy travellers. Selection of bread and sandwiches and tea and coffee bags for you to choose. Hot food was available at this timing. A nice selection of warm food for supper. This is a big difference comparing my experience at Hong Kong Premium Lounge (Land Side) during this timing, you can check out my report over here. Overall I am quite satisfied with the selection and quality of food. I sat at the seat facing the clock and the screen, to make sure I don't dozed off and forget about the time, but it didn't matter anyway since I had only 4 hours to stay which means 0430, I had to leave. Before I left, I made myself a nice cup of cappuccino. This is what I had at the lounge. The food at this lounge is 'halal' certified for our Muslim friends. Showers are also provided in this lounge, just let the staff and she will provide a towel. Once I was done, I walked around for a while at terminal 2 departure hall before making my way to the gate. Make sure you plan your timing if you intend to shop around. Always good to be at the gate at least 30 minutes before it closes. Looking at the crowd, it seemed to be a full flight and it was according to a cabin crew whom I talked to during the flight. Boarding process was a bit messy as lots of passengers got up to board. The announcement was not clear and ended up the ScootBiz passengers, passengers with elderly or children and others boarded the aircraft almost the same time. I followed suit not long after and made my way to my seat hoping to take some photos and video of the take off and landing. My first look at the cabin: For the 1st section of the cabin, I didn't want to sit at one of those two rows because it was near to the toilet but at least they have actual windows at the window seats. When I turned to my row, I had to check twice to see if I was at the correct seat. No window seat! 'WTF?, A disaster! Calamity!!' These words came into my mind instantly and even the coffee I drank earlier was not powerful enough to wake me up instantly. (Do note that I didn't sleep the night before.) To make matters worse, the seats beside mine were taken and I won't have both window view and extra leg room space to enjoy. These rows in the 'ScootinSilence' have no extra legroom space, in fact they are pretty tight and by the end of the 4-hour flight, my kneecap was hurting. So for this flight, no window shot photos except after the flight which the cabin crew was kind enough to let me take the Scootbiz cabin photos. According to the crew, they worked SIN-DMK (Bangkok Don Maueng Airport)-Osaka sector, a night stay at Osaka before returning back to Singapore. No stop-over for them and this also applies on SIN-KHH (Kaohsiung)-Osaka sectors. At least on this flight, I manage to take some photos of the cabin. For ScootBiz passengers, there are actual windows for each window seat! Like I mentioned before, this product to me is equivalent to Premium Economy Class, no matter how the airline promote this product. You can see how small this cabin is compared to the 787-9. Its very easy to spot my seat from this photo, can you see it? Identical seats as the Boeing 787-8. I have taken some photos from this trip report, you can check them out over here. Meanwhile, I took some photos before, during and after the flight! ScootBiz was around 75% full. The typical seat pitch of a Low Cost Carrier, its tighter than the premium Boeing 787 operators. Some posters on the back of the seat would be nice, instead of leaving it blank. The seat pitch was tight! There is an extra row in the middle section of the 'ScootinSilence' cabin. I can only feel sorry for myself as this young traveller in front took video of the take-off and landing and photos during the flight, that made me even more frustrated! Do note that electronic devices can be used at all times but they must all be in-flight mode and do pay attention to the safety demonstration - that could be useful when a situation arises. Every seat was taken up so there was no chance of moving to another seat, not to mention a window seat. I doubt anyone would want to exchange seat with me. Full house in this section. I reckon the passengers enjoy flying the Boeing 787 Dreamliner. I was probably the only one taking photos of the cabin. The light indicator tells you whether the toilet is occupied or not. These photos were taken after the flight. Checking out the other seats of this aircraft's configuration. Remember to give row 7A a miss when flying the Boeing 787-8 Dreamliner aircraft. I may try out this seat, row 5K on my next 787-8 flight with this airline. This is the bulkhead row of the Economy Class, row 4. Notice the Nok Air Sticker? I wonder how did it get it onto this aircraft's seat. Hopefully this helps you decide on the meal before pre-ordering. If you ask me, the prices are ridiculously expensive if you order on board. There are also airline's magazines, disposal bag and the airline's in-flight magazine at the seat pocket, but somehow I forgot to photograph them. In-flight meal - I don't know why I chose salad for breakfast, I would have gone for noodles or something filling. I remember choosing Milo for my drink, why was I given a can of coke for a morning flight? I wanted to check with the crew whether I can change, but decided to keep the drink instead for my brief stopover at Kaohsiung Airport. There was a mixture of experience and inexperience crew, its very easy to tell. A few of them were friendly while the rest were reserved. I find the service overall to be just average - nothing to shout about. Perhaps for the friendly crew whom wanted to offer me a change of seat on the next sector Kaohsiong to Osaka, that's a nice gesture from him. This same crew also encouraged me to take as many photos as I like, I should have written down his name to compliment him to the company. We need more down-to-earth crew like him. My flight pushed back slightly late but we landed on time. The ride was smooth for most parts and I tried to get some sleep on board but I failed. Instead of taking window-shot photos, I spent the time playing my mobile phone games and enjoying the flight. It felt strange not to have a window to look out at any point of the flight. I managed to take a window shot photo after the flight though, this was the view that I wanted; both the wing and the engine plus the scenery. On arrival at Kaoshiung Airport - my 2nd time here. Thanks for the ride, 9V-OFA! This aircraft was being prepared for departure to Osaka. The walk from the aircraft to the immigration counter took around 10 minutes. Cleared immigration and I was at the luggage carousel. This is the arrival hall for international flights. 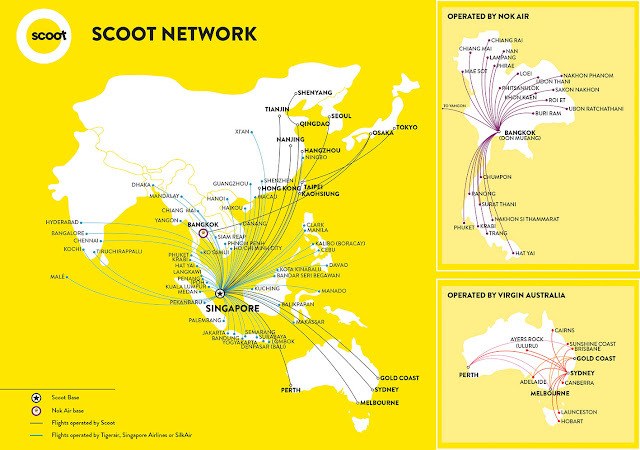 Scoot is a Low Cost Carrier that carries you from point A to B. Just like the others, you have to pay for convenience and the more comfort you prefer, the more you have to pay. I strongly disagree with this comment "You pay for what you get" especially when things goes wrong with Low Cost Carriers. Let me explain briefly. 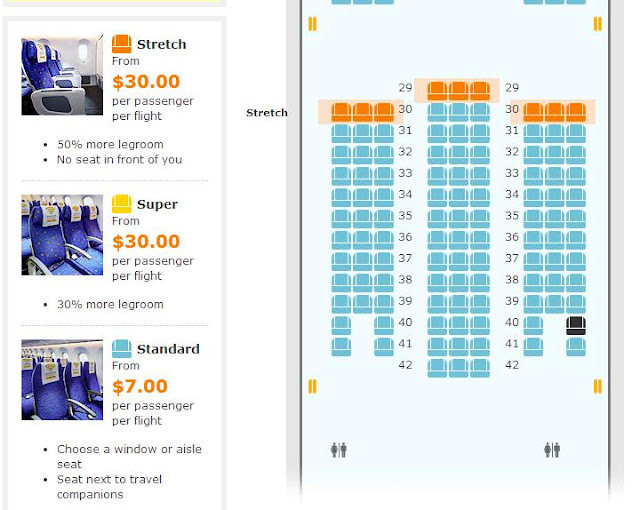 "You pay for what you get" applies to the options that you choose for example, paying more for a comfortable seat, in-flight meal, better legroom space, WiFi and anything else that makes your flight more comfortable. Otherwise, this term should not used on flight delays or cancellation. Why? When you make payment with the airline, its like signing a contract with it - what's the minimum requirement? To get you from point A to B - simple as that. Whether its Premium or Low Cost, the airline has to fulfil its obligation. Flight delay is inevitable but how the airline managed it is another story. Passengers get pissed off because of how the airline handles the situation such as the lack of contingency plan (no staff to help out the stranded passengers as a result, passengers get confused and eventually angry (You can't blame them, can you?). Airlines need to be vigilant and be well prepared when such occasions occurred. Training the staff and getting them on standby just in case such events happen would help to recover not just the service, also the reputation of the airline. This gives passengers more confidence with the airline. Another issue is compensation. There are some passengers wishing for 5 star hotel and other luxurious compensation especially flying on Low Cost Carriers. I am sorry to tell you that you shouldn't expect much. The most these airlines can do is to put you in a cheap hotel and fly you out the next day (Different airlines = different policies). So if you are scared of such events happening, either you get yourself an insurance to claim back some money for the loss time or pay more and fly on the premium airlines. Usually airlines flying on popular routes with many flights a day is easier to rebook to other flights (depends on the loading of other flights). Flying with Low Cost Carriers has its own disadvantage such as no interline agreement with other airlines that means this airline can't transfer passengers to other carriers when the flight is delayed or cancelled for whatever reason as it doesn't have any agreement with them and even if the other airline agrees to pick up the stranded passengers, the cost of transferring these passengers may be too much for the affected airline to absorb. Most of the time for the established Low Cost Carriers, the flights are uneventful. Most passengers enjoy the benefit of saving money on air travel when things goes according to plan. Anyway back to my flight, I found it to be underwhelming mainly due to the window seat without the window and that made me frustrated. The airline should charge less for it if you ask me. Meal and in-flight service was average, maybe a couple of crew were good but other than that, nothing spectacular. Another good report Charles, Shame it was your longest 787 flight and it was windowless. Do you recall if you had trouble accessing the toilet on the other aisle from your windowless seat on the 787-800? Is there walking room behind the last middle row without having to walk across the front of row 9DEG? I'm contemplating getting seats on ABC but only if I can get to a washroom quickly enough. Appreciate your help there, thanks! No, I didn't. There is a walking passage behind the last row of the middle row, so going to the toilet isn't an issue. Do note that row 7A is windowless on the 787-8 aircraft only. Thanks so much! You've been a great help. Will definitely take note to avoid 7A. My partner and i booked for 5D&5E in scoot silence. based on your experience, do you think we should upgrade for the stretch seats?